Despite widespread discrimination against lesbian, gay, bisexual, and transgender (LGBT) people, federal and most state law still does not explicitly protect LGBT people from discrimination in employment, housing, and public accommodations. And anti-LGBT opponents are using false and misguided fears about safety and privacy in bathrooms to defeat nondiscrimination protections and to restrict transgender people’s access to restrooms. 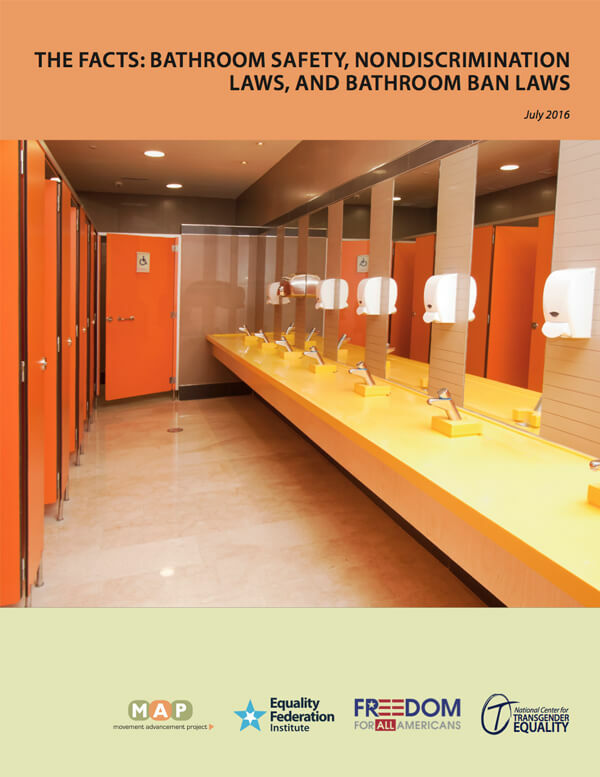 The Facts: Bathroom Safety, Nondiscrimination Laws, and Bathroom Ban Laws provides a thorough and rational discussion of the legal landscape pertaining to nondiscrimination laws, bathroom ban laws, and restroom safety. Nondiscrimination laws that explicitly protect LGBT people have been enacted in 18 states and more than 200 municipalities—with no increase in public safety incidents. Additionally, harming someone in a restroom is already illegal and updating nondiscrimination laws to protect LGBT people doesn’t change that. By contrast, bathroom ban laws compromise public safety and can’t be enforced without invading citizen privacy. And the vagueness of the laws may provide unchecked power to law enforcement officers or even embolden private citizens to take the law into their own hands. These laws also leave transgender people even more vulnerable to discrimination, harassment, and violence. Bathroom ban laws invite lawsuits and risk loss of federal funding. Cities and states that pass such laws can also expect an added economic burden when businesses, visitors, and even other jurisdictions reduce or restrict their travel to, and business with, the area that passed the law. Finally, bathroom ban laws not only discriminate against transgender people, but they also endanger their health and contribute to a climate of harassment and criminalization that puts transgender people at risk of arrest, prosecution, incarceration, and more.